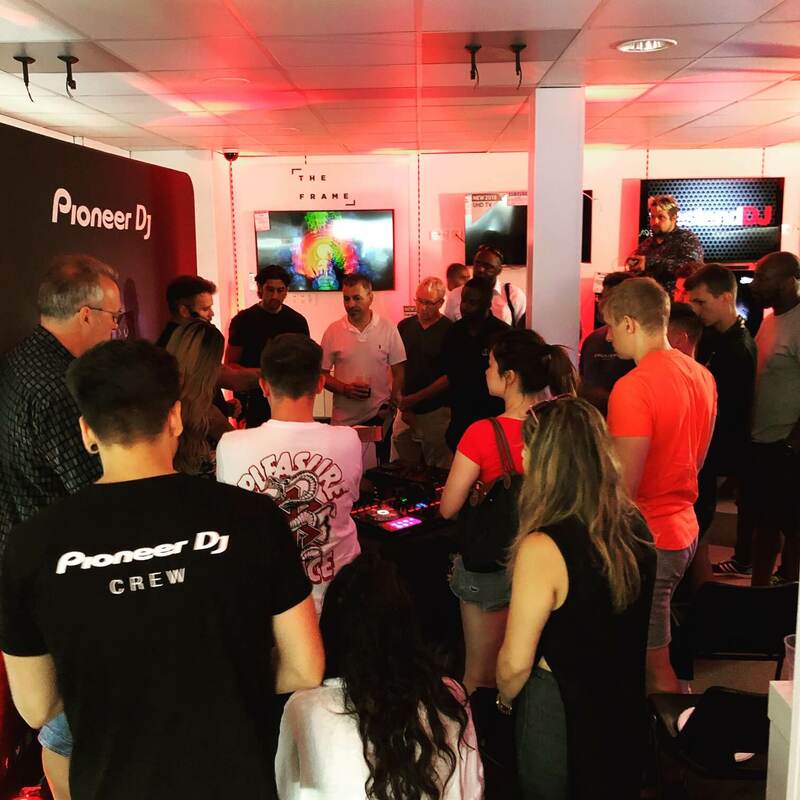 On 16th July, our westendDJ North London branch kept its doors open until 10pm for an evening of education, gear demos, pizza and beer. The night replaced the normal meeting day for NADJ members who usually link up once a month in West London to check out new gear and exchange ideas. We jumped at the chance to host this meeting to showcase the latest developments from Pioneer DJ including the DDJ400, DDJ1000 and RBDMX lighting extension. We also got to hear from the team at Singa; a revolutionary Karaoke system supplied on an iPad with access to over 35,000 Karaoke songs. Chris Binns, Chairman of the NADJ London Sessions opened the soiree and introduced yours truly (Marcus, the geezer from the videos). I had the pleasure of waving the WEDJ North London flag and got to divulge information on what we had lined up for attendees including the aforementioned exhibitors and the declaration of an amazing raffle prize: a pair of Pioneer HDJ-X10 headphones worth £299! We then got a full technical feature showcase from Sam Shepherd of Pioneer DJ on the DDJ-1000, and Sammy Qureshi (the other Sam at Pioneer DJ!) on the DDJ-400. Both of these Rekordbox controllers were very well received, with heaps of guidance and information on tap from the Pioneer crew for our attendees. 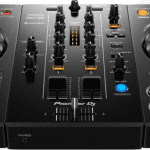 We also got the full feature spec and run-through of the new Pioneer DJ DDJ-SX3, the 4 channel Serato controller (click here to read our post on this). This was hooked up to Pioneer’s speakers, the XPRS 10 and XPRS 15″ Sub; it sounded so smooth! Pioneer DJ controllers are permanently on display in our stores amongst many others so you should pop down and check them out if you haven’t already. Next up we had Scratch that, we stopped for a Pizza and Beer break, so much was ordered that people couldn’t eat anymore! Make sure you head out for the next one! So, back to the program – next we had a full Pioneer DJ RBDMX run through from Sam, who explained how easy it was to assign lights in the software and browse through scenes. I then jumped on the mic to show everyone how we rigged the lights in the shop, and how straightforward the whole process was. I used my famous ‘Brandy Scale’ which is basically the guide as to how many Brandy’s I could consume and still be able to operate the software which is 8/10 on this – super easy! 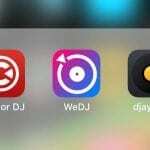 I then showed off how well the phrase analysis works by showing a track that had no tweaking, and how you could control lights ‘on the fly’ with the use of the pads on your controller or the easy menu within Rekordbox DJ. Next up we had the team from Singa, a Scandinavian company set to turn the Karaoke game on its head; their iOS apps will enable end users (your future Karaoke customers) to come and find the nearest bar that offers Karaoke, with the ability to make requests before arriving in the venue so you can cue the songs ahead of time! The Professional version also includes the iPad and accessories such as case and adapters making it easier to connect into your existing TV and PA system. We are really excited to be the official UK partner of Singa and you can check their pro package out on our website here, and view the domestic app on the app store here. The NADJ (or National Association of Disc Jockeys) then took to the stage to talk about their organisation, and why you should join. The NADJ is a not-for-profit organisation designed to support DJ’s across the UK to discuss important topics and share wealth in knowledge and experience. They have branches across the UK that meet in London, Essex, South England, Midlands and Scotland to name a few. Even if you don’t attend their meetings (free for members), you can join and get a £10m Public Liability Insurance policy to cover you, your employees and products. This offered at an extremely competitive rate of £75. You can read more and sign up to NADJ here. So thats all folks, if you were there, it was great seeing you. If you weren’t there, we will see you at the next one! We did mention free Pizza and Beer!